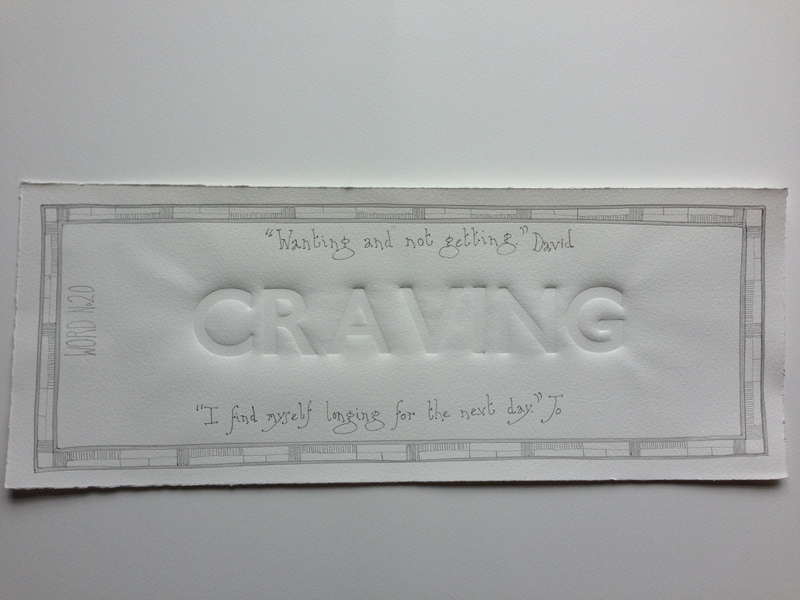 David: Confinement tends to breed craving. The irrational desire for things you don’t need but really want seems to become so much more intense when the absolute impossibility of getting them is the reality you have to deal with. Being unable to leave my door, I’ve been craving all manner of things – an egg and cress sandwich, a pint of Guinness, a magazine to read, oh and sausages and gherkins! Wanting and not getting, the intensity of craving, actually makes you think about the thing you want in a way often lost to you when it is easily achieved. Jo: I keep thinking just how bizarre this tete a tete we are having is, friends can’t believe that I have never meet you, let alone talk to you on the phone… and somehow the fact that the world of Twitter might be reading is irrelevant. I find myself longing (craving?) for the next day, the next word, the opportunity to respond, to express myself through words and pencil marks. And each day, I find that your text resonates with me immediately, and today is no exception. After a period of some months of mental and physical turmoil I have been craving silence, good old peace and quiet…and now I have it…bliss…it wasn’t easily achieved. This entry was posted in 50/50 and tagged craving, Guinness, silence, Twitter. Bookmark the permalink.